Please enjoy Kirsty's card at the bottom of the installment. Etain opened her eyes, only to discover that she was still encased within the darkness. Mara held her within herself, though whether it was stomach or womb – or for how long – Etain was not sure. Nor did it matter. She was out of phase with the rest of all that was. Meaning, quite simply, for now she was basically nowhere. Never did like this feeling. She ran her hands over herself, sighing when they told her what her nerves sang. She was alive, and whole. No missing pieces. And no blood on the water. At least she wasn't alone. With company, she could handle this. Even if it were a once again grumpy Triton. Etain still moved further out of his reach as he finished his check. By that time, there was dim light, and she could vaguely see him, a black form against a darker darkness. It was warm, and the feeling of languid suspension calmed her just as much as her caution of a panicking Triton warred with her shaky trust. “For her, it is. Be still now children.” Mara's voice was just as hard as before. A note of preoccupation was present this time, and perhaps some fatigue. The pair did as ordered, held still and waited for whatever would come next as their eyes continued to learn to see in the strange dim light. The sense of swift movement pulled their stomachs from the usual resting place, and without further warning, the sea goddess vomited them forth. As they left her mouth, seeing starlight shining off the deadly, deeply serrated teeth, time seized them again. The disorientation increased with the leap. Etain's head contacted the side of the Sea Witch with a dull thud, at the very moment that her eyes seized on the stars. She did not have time to register the extra stars before the blow knocked her out. The Triton narrowly missed the same fate, instead his shoulder absorbing most of the blow. Etain, still wearing her skin, floated amongst her cloak and the skirts of her peasant-styled dress that had never been shucked before her dive, whilst he got his bearings. Mara groaned deeply, before once more retreating from the physical world into her separate realm. The whiteness of her skin beneath the moon and droop of her dorsal fin did not go unnoticed, nor the wretching sound that followed or the stench thereof. No reply, she was gone, leaving them beside the boat that waited patiently, drifting in the ocean's current. He called for her only once more, before sighing and tossing his trident up to the deck of the boat. It clattered, and he could feel the Sea Witch watching and listening, waiting to defend itself and its mistress if he tried any harm. He snorted and gathered the unconscious halfling woman in his arms, commanded the water to rise enough that he could jump out and onto the deck with her. Laying her down carefully, he checked her skull after. No obvious cracks or soft places that did not belong. He sat beside her, debating whether or not to remove the woman's skin. 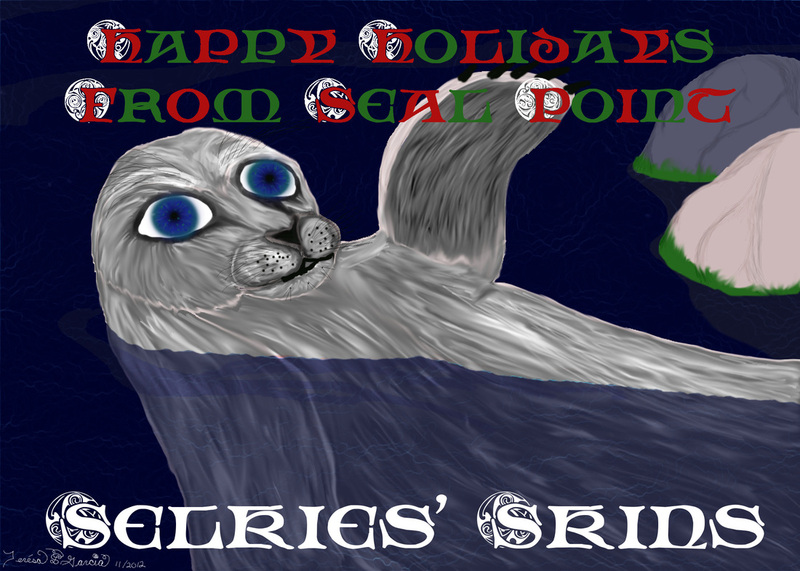 He knew the Selkies usually took off their skins on land if they were going to be there longer than to bask in the sun. Sealbloods were not at risk of drying out, yet this one... did seem to have some traces of Fishblood, if his senses were correct. Erring on the side of caution, he pulled at the seam and removed it from her carefully while praying to all the deities he knew that his choice was the correct one – or at least was the most likely to be correct. He laid it over her to preserve some of her heat. No bolt came from the sky to strike him down. No shark leaped up to snap him up, nor was there any kraken pulling him to a beaky maw and noble death of heroic struggles. A scream overhead caused him to look up, just in time to see a white tern pass over head. It let loose a bomb, faster than he could dodge since he did not see the release. Something warm, gooey, and stinky splatted on his tail, and looking down, he was dismayed to see the white guano running over his scales, reaching out from a brown pellet of an epicenter. Which of them have I angered? The ignobility!